For this blog I’m re-visiting the topic of travel and inspirational places and will return to textiles in May, with work in response to the desert landscape of the Atacama. James and I took ourselves off to Jordan to get some culture, wilderness and winter sun, although the sun element wasn’t guaranteed as spring was barely on its way, as you’ll find out. To visit Jordan is to visit Petra, Wadi Rum and the Dead Sea, and there are Roman ruins and Crusader Castles aplenty along the way. We had 10 days and trimmed the itinerary to allow us to spend a couple of nights at each stop; neither of us like charging about too much, preferring to spend time to get to know an area and its people. We were also looking forward to the food in Jordan, as Arabian flavours are a favourite of ours. After arriving on a late flight we stayed in Amman before heading south towards Wadi Musa, home of Petra. We’d opted for a car-plus-driver who would accompany us for the whole trip. Not strictly necessary but far more relaxing and not much more expensive than hiring a car. Although we knew that essentially, Jordan is one vast desert landscape, you don’t appreciate it until you start driving. There are of course green areas where crops are sown, date palms and olives grow and even vines. The water is there, deep underground and much is - astonishingly – supplied by huge aquifers beneath the Wadi Rum desert, and piped to wherever needed. First stop, Shobak Crusader Castle, perched high on desolate, windswept hills. The place was deserted and rather lacking in information, but still provided a fascinating array of huge stone blocks, beautiful arches, intact rooms and tantalising glimpses of storage cellars and stables. Mind boggling to think of building it without the aid of modern equipment. We arrived in Wadi Musa in time for lunch and as our Monther (our driver) had been a hotelier in many parts of Jordan, he was able to recommend great eating points for most of our travels. This first stop didn’t disappoint. I’d seen information on the possibility of visiting Petra by night, so we took advantage of an afternoon kip before walking down to Petra. The site allows three night-time entries per week and the event is Bedouin run and managed. The huge cliffs facing us on the path down to the As Siq were lit by floodlights from the hills, as were the Snake and Obelisk tombs we passed en route. 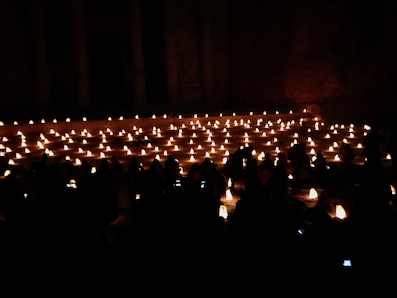 Candles sitting on sand inside paper bags lined each side of the path and whilst you are supposed to make the visit in silence, people found it hard not to talk, but kept it to murmurings. The landscape is sandstone; towering cliffs and narrow gorges which open up into a series of large open spaces and valleys. A ‘siq’ is a gorge carved out by nature, although the As Siq gorge was helped along by the Nabataens, who created Petra some around 400BC. It continued to thrive until 363AD, when it was largely destroyed by an earthquake. Walking through the Siq by candlelight was wonderful. You sensed rather than saw the great cliffs and at times the path changed to original cobblestones. At the end of the Siq we entered an open space, flooded with hundreds of candles and home to Al Khazna, commonly known as ‘The Treasury’. The Beduoin invited us to sit in silence, offered us hot mint tea and tried their best to discourage flash photography, which took some doing. We decided to give up on photography and simply enjoy the atmosphere. Reed flutes/pipes were played, stories told and songs sang. We then wound our way back out. A magical experience. The next day we set off very early, accompanied by a guide for the first couple of hours to give us the low-down on the temples, amphitheatre, tombs, churches, dwellings, monastery, caves, places of sacrifice and other areas of interest. I have to confess I was just as taken by the landscape as Petra itself; the scale of it, the multiple colours of sandstone and the lacey etchings and lines caused by rain and run-off erosion. But then, as an artist that’s hardly surprising. We walked and gawked for 6 hours before exhaustion took over and we returned home to collapse for a couple of hours. We had booked in to the Petra Kitchen for our evening meal, a restaurant where you can help to prepare the food in community.., and then eat it. All very delicious and recipes provided. The following morning we set off for Little Petra which revealed a true gem; a cave ‘room’ that had been squared up and used for 2,000+ years as a living and cooking space. The ceiling and walls were blackened with wood-smoke, hardened rivulets of tar (and possibly cooking fat) dribbled down – all sitting on top of the natural sandstone colours of cream, beige and mushroom. I took a zillion photographs and know for sure that these will inspire much work – perhaps even more work than the landscape. I reluctantly allowed myself to be dragged away as Wadi Rum was calling. We wound along bendy roads, climbing, climbing, climbing and then swept back down in to a large valley with the great escarpments of Wadi Rum in the distance. The wind was building and poor weather forecast – we didn’t know quite how bad until the next afternoon. After signing in at the visitor centre, we were met by a 4x4, abandoned the car and took off to our desert camp leaving tarmac behind and entering the most breath-taking environment. We stayed at ‘Dream Camp’ which proved a great recommendation by Travel Local, our booking agent. Small, welcoming, with lovely staff, great food and a never-empty kettle of mint tea on the open fire. All 750 square kilometres of Wadi Rum is ‘run’ by the Bedouin whose main source of work and income is now tourism, although sheep, goat and camels are still a key element of their lives. During our time in Wadi Rum we took three 4x4 excursions in to different areas with a Bedouin driver, stopping regularly to walk or simply sit and stare. I confess to hauling about 5kg of ‘dirt’ home with me and am looking forward to using it in my work. Our excursions were cancelled one afternoon due to the arrival of the forecast bad weather; terrific wind, sandstorms, heavy rain and at one point, snow. We spent the afternoon bundled up in the communal area, reading our books, chatting to the other guests and drinking tea. All very cosy. The staff had managed to get the below-ground oven loaded up before the storm hit, so supper was as good as usual and very welcome in the cold. By the following morning the storm had passed, leaving a mix of cloud and sun and very textured, crusty sand as a result of the rain. After our final 4x4, we set off north to the Dana Biosphere. Going back over the mountain we encountered more wind, freezing fog, snow and a landscape covered in snow and hoarfrost; very beautiful but a stressful drive for Monther, but a good lunch-stop helped! We were lucky to reach Dana due to the conditions, but Monther kept the faith, took it slowly and got us there. We stayed in a community run hotel; very simple, not quite warm enough for the weather but with great food, lovely staff and once again, fantastic food. By morning the snow had cleared and we set off with our guide Ahmed, a truly delightful man who’d been born in the area and knew the landscape, flora and fauna extremely well. We descended down through gorges, stood and gazed on rocky outcrops, saw many birds (including an owl, surprising during the day), a porcupine cave and traces of marmot. All of that and tea al fresco! All in all, a truly lovely experience. We then continued north, where the plan had been to collapse in some sunshine at the Dead Sea for a day before coming home. The trip up, across and down the mountains in to the Dead Sea Valley was stupendous, but the area itself did nothing for us. Five or six enormous, ‘resort-style’ hotel complexes, poor food and zero atmosphere; not our thing at all, and we should have known that. We cut short our stay and headed instead to Madaba, Monther’s home town, stopping of at Mount Nebo on the way to take a look across to the Occupied Territory.., and have lunch. Monther showed us the key sites in Madaba itself; the orthodox church with its mosaics, the Catholic church with its underground tunnels and rooms and of course, a good restaurant recommendation. We finished the day off with a dip in the thermal springs at Hammamat Ma’in; deliciously hot and very relaxing. For anyone who is captivated by remote landscape, Jordan is a must. It is safe to visit, and the combination of ancient and modern culture, differing ‘desert’ landscapes, great food and friendly people make it a truly special place to spend time in. Now we’re back, my focus is once again on studio work where I’ll be continuing to translate the Atacama Desert in Chile.., but I feel that Jordan will creep in to this body of work. Both are deserts and both are dear to me. The next essay will offer some images of the Atacama which although also a desert, is quite different to Wadi Rum. So far I have completed five Atacama pieces and more should be on their way by April. I’ll include detailed images of where I’ve got to, along with information about my process.